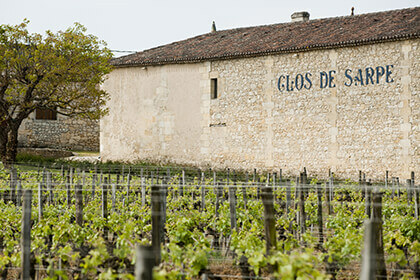 Located near the ancient village of Saint-Emilion, Chateau Clos de Sarpe is an independent family owned vineyard that has been owned by the Beyney family for three generations. Jean-Guy Beyney is passionate about Clos de Sarpe and works the vineyards with a respect for the land and a permanent quest for perfection. The estates old vines give very low yields producing fruity wines that are highly concentrated. Vinified with passion and enormous respect for tradition, Clos de Sarpe produces beautiful and complex Merlot dominated wines with incredible longevity. Originally owned by Baron du Foussat de Bogeron, Chateau Clos de Sarpe began a new chapter in its history when it was purchased by Jean Beyney in 1923. Since then, the estate has remained in the Beyney family for three generations, and is now managed by Jean-Guy Beyney and his wife, Christine. Under Beyney ownership, the 3.70-hectare vineyard has become fully biodynamic and today produces some of the most sought-after expressions of Bordeaux Right Bank terroir. In fact, terroir is key at this jewelry-box-sized property, a Grand Cru Classe of the Saint-Emilion appellation. Its classification has been recognized since 1954 and is one of the most prestigious of Bordeaux. The vines of the estate are planted on the “Sarpe plateau,” the sun-soaked southeast-facing slopes of a limestone hillside with a thin layer of clay covering the surface. These limestone soils are rich in calcium, retaining plenty of water even during the dry months of summer and contributing mineral nutrients to aid the development of the vine. Best suited to this type of soil is thin-skinned Merlot, which occupies 85% of the parcel. The remaining 15% is planted with Cabernet Franc. While one-third of the vines were planted between 10 and 25 years ago, the remaining two-thirds are very old, between 55 to 80 years, making them some of the oldest in the appellation. These mostly old vines are planted at a density of 5, 500 vines per hectare and produce a very limited yield of only around 25 hectoliters per hectare. 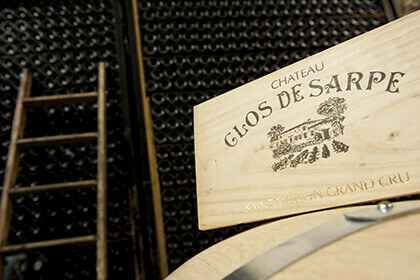 At Chateau Clos de Sarpe, the focus is very clearly not on quantity. Their wines are very rare and highly concentrated expressions of Saint Emilion’s clay-limestone terroir, a treat for those who love wines of high quality and authenticity. In order to best preserve the character of this very special terroir for generations to come, Chateau Clos de Sarpe practices reasonable agriculture without the use of harmful chemical additives out in the vineyards. The vines are encouraged to produce high quality, very concentrated fruit in a natural way, through extensive branch removal, de-budding, grape and leaf thinning, all done manually. Having eliminated pesticides, insecticides, herbicides and chemical botrytis treatment, the vineyard team uses only the natural and harmless Bordeaux mixture of copper sulphate and calcium oxide in water to prevent the onset of mildew and other fungal attacks. The harvest is quite late, to ensure the maximum concentration of flavors in the fruit, and is carried out by hand. The respectful and patient approach applied in the vineyard of Chateau Clos de Sarpe continues at the winery, where very modern practices meet traditional ones. After an eight to ten day maceration, the grapes undergo a long, very gradual four to five week fermentation and maceration with micro-oxygenation in cement and stainless steel vats. This slow, meticulous, gradual extraction results in wines of intense concentration and an impressive capacity for age, due to high levels of tannin. 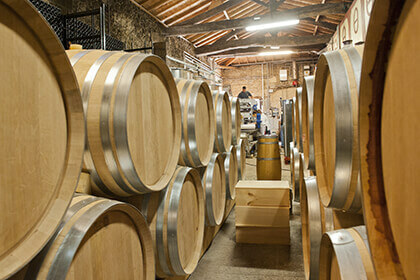 These tannins are then soften and refined during 16-18 months of maturation in 100% new oak barrels. 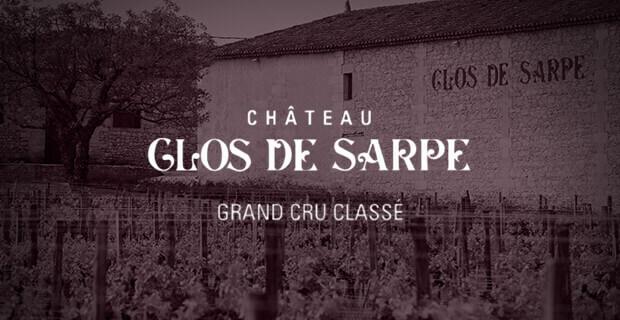 The result can only be described as the unmistakable signature style of Chateau Clos de Sarpe, a powerful expression of a blessed terroir, a wine rich with notes of black fruit, smoke and licorice. In 1997, the estate released the first vintage if second wine, Clos de Sarpe, which has distinguished itself with its elegance, flexibility and its warm, aromatic finish. During the week of Wine Futures (or En Primeurs), an annual event taking place in the month of April in Bordeaux each year, Clos de Sarpe welcomed Lisa Perrotti-Brown, Master of Wine and journalist for The Wine Advocate. Her article, published on May 31, 2018 provides a detailed account of her visit to the property, during which time she focused her attention on understanding the unique history of the property, the distinct characteristics of the terroir and the evolution of the estate’s two great wines. In her article, she shared her experience touring the small winery, whose concrete tanks, purchased in 1950, she describes as “retro-chic” in style. She wrote about the old vines and the incredible concentration achieved in their limited yields of only 25 hectoliters per hectare. This concentration is, nevertheless, balanced with a low pH, equating to a longevity in terms of aging in the bottle and a remarkable freshness maintained despite age. In her article Lisa Perrotti-Brown encourages her readers to discover the fascinating history of Chateau Clos de Sarpe through its wines. 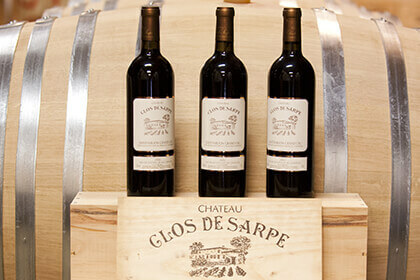 Sharing a rare bottle of Clos de Sarpe is a special experience indeed. This is a wine made from a limited yield of fruit, highly concentrated in flavor, grown on very old vines in a precious terroir, on a very small vineyard on the Sarpe plateau. While the ideal sun exposure and remarkably rich soil already help guarantee an excellent quality in the fruit, the effects of terroir are allowed to shine to the fullest through a biodynamic treatment of the vines, with minimal human intervention. This philosophy is also apparent in the winemaking, which stresses a patient, gradual approach to extraction in order to get the most out of the precious grape skins. 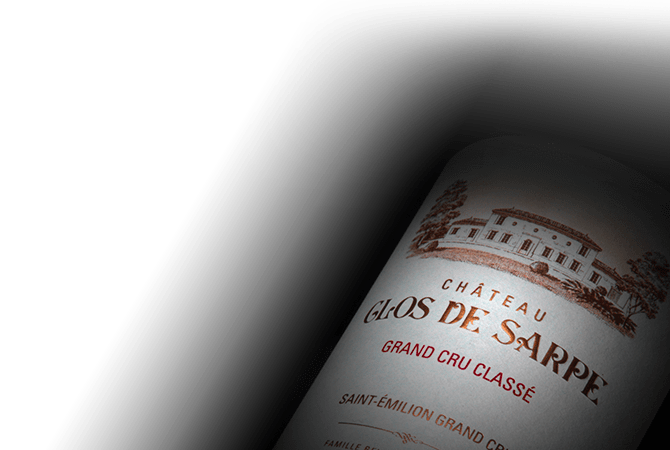 In the tradition of the great wines of Bordeaux, the Grand Vin of Chateau Clos de Sarpe is aged in new French oak in the highest quality, helping round out the tannins in the wine and prepare it for many years of aging in the bottle.